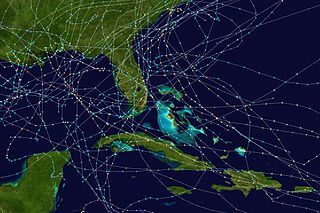 The list of Florida hurricanes from 1975 to 1999 encompasses 83 Atlantic tropical cyclones that affected the U.S. state of Florida. Collectively, tropical cyclones in Florida during the time period resulted in at least $45 billion (2008 USD) in damage, primarily from Hurricane Andrew. Additionally, tropical cyclones in Florida were directly responsible for 54 fatalities during the period. Several tropical cyclones produced over 20 inches (500 mm) of rainfall in the state, including Hurricane Georges which is the highest total during the time period. The 1985 season was the year with the most tropical cyclones affecting the state, with a total of eight systems. Every year included at least one tropical cyclone affecting the state. The strongest hurricane to hit the state during the time period was Hurricane Andrew, which was one of only three Category 5 hurricanes to strike the United States. Andrew, at the time, was the costliest tropical cyclone in United States history. Additionally, Hurricane Eloise and Hurricane Opal hit the state as major hurricanes. June 27, 1975- The tropical depression that later becomes Tropical Storm Amy drops light rainfall in the eastern portion of the state. July 29, 1975- A tropical depression moves into southern Mississippi after creating a strong convergence zone with a ridge over the western Atlantic Ocean. The convergence zone produces heavy rainfall of up to 20 inches (510 mm) along the western Florida Panhandle, resulting in moderate stream flooding and $8.5 million in damage in the state (1975 USD, $34 million 2008 USD). September 23, 1975- Hurricane Eloise makes landfall near Destin with winds of about 125 mph (200 km/h), producing light precipitation across the peninsula with heavier amounts near the landfall location peaking at 14.9 inches (378 mm) at Eglin Air Force Base. Hurricane-force winds and storm surge of up to 16 feet (4.9 m) across the panhandle destroy 500 small businesses and damage or destroy 8,000 houses. Damage in the state totals $100 million (1975 USD, $400 million 2008 USD). October 1, 1975- A tropical depression hits the western Florida Panhandle, though its effects, if any, are unknown. October 16, 1975- Southern Louisiana is struck by a tropical depression, with its outer rain squalls and slightly above normal tides reaching the northwestern portion of Florida. May 23, 1976- Subtropical Storm One strikes near Saint Marks, producing slightly above normal tides, minor beach erosion, and beneficial precipitation. June 11, 1976- A tropical depression moves northeastward across the southern portion of the state, resulting in only minor effects. August 19, 1976- Tropical Storm Dottie hits the southwestern portion of the state, dropping heavy precipitation across its path including around 8 inches (200 mm) in the Coral Gables. The rainfall led to flooding and road closures near Miami. September 13, 1976- The combination of a mid-level low and a stationary front lead to the development of Subtropical Depression Three over the center of the state. It tracks north-northeastward and intensifies into a subtropical storm, though its effects in the state, if any, are unknown. August 27, 1977- The precursor tropical disturbance of Hurricane Anita crosses the state and drops light precipitation. September 5, 1977- The outer rainbands of Hurricane Babe produce moderate rainfall throughout the state as it makes landfall on southern Louisiana. June 22, 1978- A tropical depression dissipates shortly after striking the southwestern portion of the state. Damage, if any, is unknown. July 11, 1979- Hurricane Bob hits southern Louisiana, with its outer rainbands dropping 3 inches (76 mm) of rain along the western Florida Panhandle. September 3, 1979- Hurricane David brushes the eastern coastline after moving ashore near Palm Beach, producing heavy rainfall with one location reporting over 10 inches (250 mm) of precipitation, as well as strong winds which result in $95 million in damage (1979 USD, $282 million 2008 USD), primarily in Palm Beach County. The hurricane causes five casualties in the state. September 12, 1979- Hurricane Frederic makes landfall near the Alabama/Mississippi border, having produced tropical storm force winds in the Dry Tortugas a few days before. The hurricane drops rainfall throughout the state and kills one person off Pensacola when a person is swept from their boat. September 24, 1979- The remnants of Hurricane Henri bring rainfall and river flooding to the western portion of the state. August 7, 1980- Hurricane Allen passes about 310 miles (500 km) south of Key West, Florida. The threat of the large hurricane prompts the National Hurricane Center to issue gale warnings for the Florida Keys. The hurricane produces gale force winds across the keys, though there was no significant damage. November 8–12, 1980- An inflow band from Hurricane Jeanne over the central Gulf of Mexico combines with a stationary cold front, producing torrential rainfall across southern Florida. Key West International Airport records a peak total of 24.98 inches (634 mm), with over half of it falling in one six-hour period. November 18, 1980- A tropical depression brings moderate precipitation to the state after merging with Hurricane Jeanne. August 17, 1981- Tropical Storm Dennis makes landfall on the southwest portion of the state, and drifts northeastward across the state. The rainfall is generally beneficial, though totals of over 20 inches (500 mm) cause moderate flooding damage in southeastern Florida, including $15 million ($36 million 2008 USD) in crop damages in Dade County. November, 1981- An unnamed subtropical storm produces coastal flooding and beach erosion along the eastern coastline while located over the open Atlantic Ocean. Early June, 1982- Hurricane Alberto stalls over the eastern Gulf of Mexico, though its outer bands produce moderate rainfall across the state, peaking at 16.47 inches (418 mm) in Tavernier. The hurricane produces tornadic activity across the state, and the storm results in generally minor damage. June 18, 1982- A subtropical storm makes landfall near Yankeetown, and produces moderate precipitation of up to 10.72 inches (272 mm) near DeSoto City. The rainfall leads to 3 deaths, and damage from the storm totals to $10 million (1982 USD, $22 million 2008 USD). September 11, 1982- Tropical Storm Chris strikes Louisiana, with its outer rainbands dropping over 7 inches (175 mm) of precipitation near Apalachicola. August 28, 1983- Tropical Depression Barry makes landfall as a tropical depression near Melbourne. It drops light rainfall across the southern portion of the state, peaking at 3.01 inches (76 mm) in Wauchula. September 9, 1984- Tropical Storm Diana passes within 65 miles (100 km) off the northeast Florida coast. The storm produces moderate rainfall of up to 3.13 inches (79.5 mm) in Jacksonville. Diana also produces wind gusts of up to 69 mph (112 km/h) as well as tides 2.6 feet (0.8 m) above normal. September 27, 1984- Tropical Storm Isidore makes landfall on Jupiter with 60 mph (95 km/h) winds. Isidore drops moderate rainfall of over to 6.5 inches (175 mm), and produces a storm tide of around 3.2 feet (1 m). Isidore kills one person and causes $1 million in damage (1984 USD, $2.1 million 2008 USD) across the state. October 26, 1984- A tropical depression crosses the state without dropping much precipitation. July 23, 1985- Tropical Storm Bob makes landfall near Fort Myers, and while slowly moving across the state it drops heavy rainfall peaking at 21.5 inches (546.1 mm) in Everglades City. Despite the rainfall, damage is minimal. August 15, 1985- Hurricane Danny strikes southern Alabama, with its outer rainbands drop over 3 inches (75 mm) of rainfall in western Florida. August 28 – September 6, 1985- Hurricane Elena moves northeastward through the Gulf of Mexico, loops about 50 miles (80 km) off the coast of Cedar Key, and turns northwestward to hit Mississippi. The hurricane produces precipitation across the entire state, with a peak of 15.67 inches (398 mm) in Cross Key. 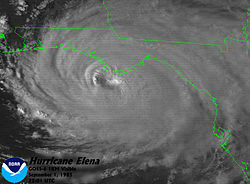 Elena causes a 9.8 foot (3 m) storm surge near Apalachicola, where the oyster industry experiences severe losses from the hurricane. October 10, 1985- Minimal Tropical Storm Isabel hits extreme northeastern Florida, dropping light rain along its path; damage is minor. Late October, 1985- Hurricane Juan moves erratically over the northern Gulf of Mexico and hits Pensacola as a tropical storm. It produces precipitation across much of the state, peaking at over 10 inches (250 mm) in the extreme western Florida Panhandle. November 21, 1985- Hurricane Kate makes landfall near Apalachicola as a Category 2 hurricane, producing up to 8.32 inches (147 mm) of rainfall in Panama City. Tides of over 10 feet (3 m) above normal result in further beach erosion near the coast. Just two months after Hurricane Elena affected the area, the passage of Hurricane Kate causes further damage to oyster beds, leaving many people without employment. Kate causes $300 million (1985 USD, $600 million 2008 USD) in damage and three deaths in the state. June 26, 1986- Hurricane Bonnie strikes the Texas coast, with its outer rainbands produce over 1 inch (25 mm) of rain in the extreme northwestern Florida Panhandle. August 13, 1986- The precursor disturbance that later becomes Hurricane Charley moves over northwestern Florida, causing light to moderate amounts of precipitation of up to 8.61 inches (219 mm) near Steinhatchee. August 14, 1987- A tropical depression enters the Florida Panhandle from the northwest. It produces rainfall across much of the state, with the extreme western Florida Panhandle receiving over 10 inches (250 mm) of rain. September 7, 1987- Tropical Depression Nine forms to the east of the state, producing over 3 inches (75 mm) of rain near Homestead. October 12, 1987- Hurricane Floyd moves through the Florida Keys, dropping up to 10.07 inches (256 mm) of rain in Fort Pierce. November 4, 1987- The extratropical remnant of Tropical Depression Fourteen makes landfall near Spring Hill, Florida, dropping up to 10.23 inches (260 mm) of rain at Loxahatchee National Wildlife Refuge. May 30, 1988- A tropical depression moves northward to the east of the state, producing light rainfall peaking at 3.18 inches (81 mm) in Pompano Beach. August 4, 1988- Tropical Storm Beryl forms to the south of Mississippi and moves slowly for several days over coastal areas of Louisiana. The outer bands of the storm drop over 7 inches (175 mm) of rain along the Florida Panhandle, resulting in very minor damage. August 13, 1988- Tropical Depression Four makes landfall in extreme northeastern Florida, producing light to moderate rainfall throughout the entire state peaking at 7.72 inches (196 mm) in Homestead. August 23, 1988- Tropical Storm Chris parallels the east coast of the state and drops over 3 inches (75 mm) of precipitation in various locations. September 4, 1988- Tropical Depression Ten strikes Louisiana, producing moderate rainfall across northern Florida with totals of over 5 inches (125 mm) near Apalachicola. September 10, 1988- The outer rainbands of Hurricane Florence produce heavy rainfall of over 10 inches (250 mm) in the extreme northwestern region of the Florida Panhandle, destroying 30 houses and damaging 50 homes from river flooding. The hurricane also spawns several tornadoes. September 13, 1988- Squalls from the enormous Hurricane Gilbert bring rain to South Florida as the storm lashed the Cayman Islands in the western Caribbean. November 23, 1988- Tropical Storm Keith makes landfall near Sarasota as a 65 mph (105 km/h) tropical storm. The storm drops up to 10.27 inches (261 mm) of precipitation in Saint Leo. Keith produces 2 tornadoes, and overall damage from the storm totals $3 million (1988 USD, $5.5 million 2008 USD). Late June-Early July, 1989- The remnants of Tropical Storm Allison produce moderate precipitation of over 3 inches (75 mm) across much of the entire state. September 22, 1989- Hurricane Hugo makes landfall on South Carolina, dropping trace amounts of rainfall in Jacksonville. Wind gusts peaked at 30 mph (48 km/h) in Saint Augustine. May 25, 1990- Tropical Depression One passes to the southwest of the state, producing 6.2 inches (157 mm) of rainfall in Royal Palm Beach with its convection located primarily to the east of the center. July, 1990- Rip currents from Hurricane Bertha kill two surfers in northern Florida. October 9, 1990- Hurricane Klaus dissipates to the east of the state, though its remnants result in moderate winds throughout the state and rough seas in eastern Florida. Klaus causes beach erosion and heavy rain squalls, as well. October 12, 1990- Tropical Depression Marco makes landfall near Cedar Key after paralleling the coast as a tropical storm. It drops moderate precipitation throughout the state which peaks at over 5 inches (125 mm) near Saint Petersburg. June 30, 1991- A tropical depression which later becomes Tropical Storm Ana moves over southeastern Florida and exits near Jacksonville, dropping light to moderate rainfall peaking at 7.86 inches (200 mm) in Punta Gorda. October 16, 1991- Tropical Storm Fabian moves through the Florida Straits and produces light rainfall peaking at 4.19 inches (106 mm) in Conch Key. June 25, 1992 - Tropical Depression One strikes western Florida, dropping heavy rainfall peaking at 25 inches (635 mm) in Arcadia. The rainfall causes over $2.1 million in damage (1992 USD) and 2 deaths. August 24, 1992 - Hurricane Andrew makes landfall on Homestead, just south of Miami, as a Category Five hurricane with winds of 165 mph (265 km/h). The winds destroy 25,524 homes and damage 101,241 others in southern Florida, leaving up to one-quarter million people temporarily homeless. In Homestead, more than 99% of all mobile homes are completely destroyed. Hurricane Andrew causes $25.5 billion in damage (1992 USD, $39.2 billion 2008 USD) in south Florida and 15 direct deaths. At the time, Andrew was the costliest North Atlantic hurricane in the history of the United States, though has since dropped to fifth after Hurricanes Katrina, Ike, Sandy, and Harvey. September 29, 1992 - Tropical Storm Earl turns to the north while located off the coast of northeastern Florida, dropping over 7 inches (175 mm) of rain near Lake Okeechobee. June 1, 1993- Tropical Depression One passes to the southeast of the state, producing heavy rainfall peaking at 9.4 inches (239 mm) in Tavernier. July 3, 1994- Tropical Storm Alberto makes landfall near Destin, dropping moderate rainfall across the state including over 20 inches (500 mm) along the Florida Panhandle. Heavy rainfall throughout the area results in extensive flooding, with the Apalachicola and Chipola Rivers exceeding a 100-year flood event. 300,000 chickens and 90% of the oyster crop in Apalachicola Bay perish. Damage in Florida totals $80 million (1994 USD, $116 million 2008 USD)). August 15, 1994- Tropical Storm Beryl strikes Panama City, producing moderate rainfall reaching a maximum of 10.69 inches (272 mm) in Apalachicola. The storm results in $6.9 million in damage (1994 USD). October 2, 1994- The remnants of Tropical Depression Ten produces rough seas and heavy rainfall, flooding roads and homes in western Florida. Damage totals $5 million (1994 USD, $7.3 million 2008 USD). November 16, 1994- Tropical Storm Gordon makes landfall near Fort Myers. The storm drops heavy rainfall across the southern portion of the state, including over 16 inches (406 mm) in Broward County. The rainfall results in heavy agricultural damage, and throughout the state Gordon causes 8 casualties and around $400 million in damage (1994 USD, $582 million 2008 USD). June 5, 1995- Tropical Storm Allison first strikes near Alligator Point and later near Saint Marks. Allison produces a 6.8 foot (2 m) storm surge in Apalachee Bay as well as scattered tornadoes, with damage amounting to $860,000 (1995 USD, $1.2 million 2008 USD). July 27, 1995- The precursor disturbance to Tropical Storm Dean produces over 5 inches (125 mm) of precipitation in portions of western Florida. August 2, 1995- Hurricane Erin strikes near Vero Beach and days later near Fort Walton Beach, producing moderate rainfall including totals of 10.14 inches (258 mm) in Melbourne and 20 inches (560 mm) in DeFuniak Springs on the Florida Panhandle. Thousands of homes are damaged near the hurricane's two landfalls, with monetary damage totaling about $700 million (1995 USD, $990 million 2008 USD). Rip currents kill a surfer off Palm Beach County, and two people die in the Gulf of Mexico when their boat capsizes. August 23, 1995- Tropical Storm Jerry makes landfall near Jupiter and drops heavy rainfall throughout the state which peaks at 16.8 inches (427 mm) near Naples. Freshwater flooding from the rainfall damages 340 homes in Collier County, with damage amounting to $20.5 million (1995 USD, $29 million 2008 USD). October 4, 1995- Hurricane Opal hits Pensacola Beach with winds of 115 mph (185 km/h). The hurricane drops moderate rainfall across much of the state, and a tornado spawned by Opal kills one person — the only direct casualty in the state from the hurricane. Strong winds and rough seas damage or destroy large portions of coastal towns along the Florida Panhandle, with serious damage extending eastward to Apalachicola. At the time, Opal is the third costliest tropical cyclone in the United States, with damage totaling over $1 billion (1995 USD) in Florida. July 11, 1996- Hurricane Bertha parallels the east coast of Florida about 175 miles (280 km) offshore, producing a storm tide of 2 feet (0.6 m) at Jacksonville Beach, as well as rip currents along the coast. Two people drown in rip currents in Miami Beach, and one pilot dies indirectly due to the storm when an evacuating military jet crashes into a house. September 2, 1996- Large swells from Hurricane Fran in the open Atlantic Ocean knock five people out of a fishing boat off Jupiter Inlet; all are rescued. October 8, 1996- Tropical Storm Josephine strikes the eastern portion of Apalachicola Bay with winds of 70 mph (115 km/h), producing a peak storm tide of 9.3 feet (2.8 m) in Suwannee and spawning at least 16 tornadoes. A tornado in Edgewater severely damages 30 houses, with the storm surge resulting in widespread coastal flooding. October 18, 1996- Hurricane Lili moves northeastward to the south of the state after striking Cuba, dropping moderate rainfall including a maximum of 12.08 inches (307 mm) in southeastern Florida. July 19, 1997- Hurricane Danny hits near Mullet Point, Alabama, producing tropical storm force winds and moderate rainfall peaking at 6.78 inches (172 mm) in Pensacola. September 3, 1998 - Hurricane Earl makes landfall near Panama City, resulting in an estimated storm surge of around 8 feet (2.4 m) and moderate to heavy rainfall peaking at 16.38 inches (416 mm) where it struck land. Two people die as a result of a boat being capsized off Panama City, and damage in Florida totals $70 million (1998 USD, $93 million 2008 USD). September 20, 1998 - The outer rainbands of Tropical Storm Hermine produce moderate amounts of rainfall throughout the state, peaking at 14.14 inches (359 mm) in Fort Lauderdale. September 25, 1998 - Hurricane Georges passes over Key West as a Category 2 hurricane, and days later it moves eastward through the Florida Panhandle after hitting Biloxi, Mississippi. In the Florida Keys, the hurricane produced 8.41 inches (214 mm) of rain in Tavernier and wind gusts peaking at 110 mph (177 km/h) in Marathon. There, Georges damages 1,363 homes and destroys 173 houses, with damage amounting to $270 million (1998 USD) in the Keys. In the Florida Panhandle, the storm drops 38.46 inches (977 mm) of rain in Munson and results in $70 million in damage (1998 USD, $93 million 2008 USD). November 5, 1998 - Tropical Storm Mitch makes landfall near Naples and drops up to 11.2 inches (284 mm) of rainfall in Boca Raton. The storm spawns five tornadoes, injuring 65 people and damaging or destroying 645 homes. Two people die in Monroe County when their respective fishing boats capsize, and damage in the state amounts to $40 million (1998 USD, $53 million 2008 USD). August 29, 1999- High surf from Hurricane Dennis paralleling the east coast of Florida causes four fatalities. September 15, 1999- Once predicted to make a landfall on the state as a major hurricane, Hurricane Floyd parallels the eastern coastline about 115 miles (185 km) offshore. At least 330 homes are damaged by fallen trees, and rough surf results in heavy beach erosion. Monetary damage totals $61 million (1999 USD, $79 million 2008 USD). September 21, 1999- Tropical Storm Harvey strikes Everglades City with a storm surge of over 2 feet (0.6 m). The storm drops over 10 inches (250 mm) of rain, flooding several homes. Damage from Harvey totals $15 million (1999 USD, $19 million 2008 USD). October 15, 1999- Hurricane Irene makes landfall on Key West and later Cape Sable, producing heavy rainfall peaking at 17.45 inches (443 mm) in Boynton Beach. The rainfall led to flooding which isolated thousands. Five people are electrocuted from the floodwaters, and three people drown when driving into flooded canals. Damage in the state amounts to $800 million (1999 USD). The following is a list of hurricanes with known deaths in Florida between 1975 and 1999. ^ David Roth (2008). "Rainfall Summary for Tropical Storm Amy". Hydrometeorological Prediction Center. Retrieved 2008-01-29. ^ Paul J. Hebert (1976). "Atlantic Hurricane Season of 1975" (PDF). National Hurricane Center. Archived from the original (PDF) on 2007-02-02. Retrieved 2007-02-02. ^ David Roth (2006). "Rainfall Summary for Hurricane Eloise". Hydrometeorological Prediction Center. Retrieved 2007-02-02. ^ a b c d Miles B. Lawrence (1977). "Atlantic Hurricane Season of 1976" (PDF). National Hurricane Center. Retrieved 2007-02-01. ^ Neil L. Frank (1976). "Atlantic Tropical Systems of 1975" (PDF). National Hurricane Center. Archived from the original (PDF) on 2007-02-03. Retrieved 2007-02-02. ^ Neil L. Frank & Gilbert Clark (1977). "Atlantic Tropical Systems of 1976" (PDF). National Hurricane Center. Archived from the original (PDF) on 2007-06-24. Retrieved 2007-02-01. ^ United Press International (1976-08-20). "Storm Dottie is Heading Inland". Archived from the original on 2016-01-20. Retrieved 2007-02-01. ^ David Roth (2006). "Rainfall summary for Hurricane Anita". Retrieved 2007-01-26. ^ David Roth (2006). "Rainfall summary for Hurricane Babe". Retrieved 2007-01-26. ^ Neil L. Frank & Gilbert Clark (1980). "Atlantic Tropical Systems of 1978" (PDF). National Hurricane Center. Archived from the original (PDF) on 2007-01-27. Retrieved 2007-01-25. ^ David Roth (2006). "Rainfall summary for Hurricane Bob". Retrieved 2007-01-25. ^ David Roth (2006). "Rainfall summary for Hurricane David". Retrieved 2007-01-25. ^ Eliot Kleinberg (2004). "David: A hit – and a miss". Palm Beach Post. Archived from the original on 2006-10-16. Retrieved 2007-01-25. ^ Paul J. Hebert (1980). "Atlantic Hurricane Season of 1979" (PDF). National Hurricane Center. Archived from the original (PDF) on 2007-01-26. Retrieved 2007-01-25. ^ United Press Inc. (September 24, 1979). "Nation says farewell to summer". Syracuse Herald-Journal. Archived from the original on January 20, 2016. Retrieved 2008-01-10. ^ National Hurricane Center (1980). "Hurricane Allen Tropical Cyclone Report Page 4". Retrieved 2006-11-06. ^ National Hurricane Center (1980). "Hurricane Allen Tropical Cyclone Report Page 6". Retrieved 2006-11-06. ^ David Roth (2006). "Rainfall Summary for Hurricane Jeanne (1980)". Hydrometeorological Prediction Center. Retrieved 2006-11-06. ^ David Roth (2008). "Rainfall Summary for Tropical Depression Fourteen (1980)". Hydrometeorological Prediction Center. Retrieved 2008-05-18. ^ David Roth (2006). "Rainfall Summary for Hurricane Dennis (1981)". Hydrometeorological Prediction Center. Retrieved 2006-11-06. ^ National Hurricane Center (1981). "Hurricane Dennis Tropical Cyclone Report Page 2". Retrieved 2006-11-06. ^ National Hurricane Center (1981). "Subtropical Storm Three Tropical Cyclone Report Page 1". Retrieved 2006-11-06. ^ David Roth (2006). "Rainfall Summary for Hurricane Alberto (1982)". Hydrometeorological Prediction Center. Retrieved 2006-11-06. ^ a b Gilbert B. Clark (1983). "Atlantic hurricane season of 1982" (PDF). NHC. Archived from the original (PDF) on 2011-12-10. Retrieved 2006-11-06. ^ David Roth (2006). "Rainfall Summary for Subtropical Storm One". Hydrometeorological Prediction Center. Retrieved 2006-11-06. ^ David Roth (2006). "Tropical Storm Chris Rainfall Summary". Hydrometeorological Prediction Center. Retrieved 2007-04-06. ^ David Roth (2006). "Rainfall Summary for Hurricane Barry (1983)". Hydrometeorological Prediction Center. Retrieved 2006-11-06. ^ a b Miles B. Lawrence & Gilbert Clark (1985). "Atlantic Hurricane Season of 1984" (PDF). National Hurricane Center. Archived from the original (PDF) on 2010-12-07. Retrieved 2006-11-06. ^ David Roth (2008). "Rainfall Summary for 1984 Tropical Depression". Hydrometeorological Prediction Center. Retrieved 2008-05-11. ^ a b c Robert A. Case (1986). "Atlantic Hurricane Season of 1985" (PDF). National Hurricane Center. Retrieved 2006-11-07. ^ David Roth (2006). "Rainfall Summary for Hurricane Danny (1985)". Hydrometeorological Prediction Center. Retrieved 2006-11-07. ^ David Roth (2006). "Rainfall Summary for Hurricane Elena (1985)". Hydrometeorological Prediction Center. Retrieved 2006-11-07. ^ David Roth (2006). "Rainfall Summary for Tropical Storm Isabel (1985)". Hydrometeorological Prediction Center. Retrieved 2006-11-07. ^ David Roth (2006). "Rainfall Summary for Hurricane Juan (1985)". Hydrometeorological Prediction Center. Retrieved 2006-11-07. ^ Staff Writer (1985-11-24). "Killer Kate Leaves 7 Dead In Its Wake". Reuters. ^ David Roth (2006). "Rainfall Summary for Hurricane Bonnie (1986)". Hydrometeorological Prediction Center. Retrieved 2006-11-06. ^ David Roth (2006). "Rainfall Summary for Hurricane Charley (1986)". Hydrometeorological Prediction Center. Retrieved 2006-11-06. ^ David Roth (2005). "Rainfall Summary for Unnamed Tropical Storm (1987)". Hydrometeorological Prediction Center. Retrieved 2006-11-21. ^ David Roth (2005). "Rainfall Summary for Tropical Depression Nine (1987)". Hydrometeorological Prediction Center. Retrieved 2006-11-21. ^ David Roth (2005). "Rainfall Summary for Hurricane Floyd (1987)". Hydrometeorological Prediction Center. Retrieved 2006-11-21. ^ David Roth (2005). "Tropical Depression Fourteen Rainfall Summary". Hydrometeorological Prediction Center. Retrieved 2006-11-21. ^ David Roth (2006). "Rainfall Summary for Tropical Depression One (1988)". Hydrometeorological Prediction Center. Retrieved 2006-11-09. ^ David Roth (2005). "Rainfall Summary for Tropical Storm Beryl (1988)". Hydrometeorological Prediction Center. Retrieved 2006-11-27. ^ National Hurricane Center (1988). "Tropical Storm Beryl Tropical Cyclone Report Page Three". Retrieved 2006-11-27. ^ David Roth (2006). "Rainfall Summary for Tropical Depression Four (1988)". Hydrometeorological Prediction Center. Retrieved 2006-11-09. ^ David Roth (2005). "Rainfall Summary for Tropical Storm Chris (1988)". Hydrometeorological Prediction Center. Retrieved 2006-11-27. ^ David Roth (2006). "Rainfall Summary for Tropical Depression Ten (1988)". Hydrometeorological Prediction Center. Retrieved 2006-11-09. ^ David Roth (2005). "Rainfall Summary for Hurricane Florence". Hydrometeorological Prediction Center. Retrieved 2007-03-04. ^ National Hurricane Center (1988). "Hurricane Florence Preliminary Report Page 3". Retrieved 2007-03-04. ^ Karl Vick (1988-09-13). "Gilbert slams into Jamaica; Hurricane may hit Gulf Wednesday". Associated Press; Reuters. ^ Miles B. Lawrence & James M. Gross (1989). "Atlantic Hurricane Season of 1988" (PDF). National Hurricane Center. Archived from the original (PDF) on 2006-12-20. Retrieved 2006-12-18. ^ David Roth (2005). "Rainfall Summary for Tropical Storm Allison (1989)". Hydrometeorological Prediction Center. Retrieved 2006-11-09. ^ National Hurricane Center (1989). "Hurricane Hugo Meteorological Statistics". Retrieved 2006-12-18. ^ David Roth (2005). "Rainfall Summary for Tropical Depression One (1990)". Hydrometeorological Prediction Center. Retrieved 2006-12-18. ^ National Hurricane Center (1990). "Hurricane Bertha Preliminary Report Page 3". Retrieved 2007-03-08. ^ Chris Colluras (2000). "Storm Chase Log". Retrieved 2006-12-19. ^ David Roth (2005). "Rainfall Summary for Tropical Storm Marco (1990)". Hydrometeorological Prediction Center. Retrieved 2006-12-18. ^ David Roth (2005). "Rainfall Summary for Tropical Storm Ana (1991)". Hydrometeorological Prediction Center. Retrieved 2006-12-19. ^ David Roth (2005). "Rainfall Summary for Tropical Storm Fabian (1991)". Hydrometeorological Prediction Center. Retrieved 2006-12-19. ^ Charlotte County Board of County Commissioners (2003). "Charlotte County Flood History". Retrieved 2007-02-23. ^ David K. Rogers; Monica Davey; Bill Duryea; Carol A. Marbin; Marty Rosen (1992-06-26). "Depression forms in Gulf". St. Petersburg Times. ^ City of Anna Maria, Florida (2006). "City of Anna Maria" (PDF). Archived from the original (PDF) on 2007-09-28. Retrieved 2007-02-23. ^ Ed Rappaport (1992). "Hurricane Andrew Tropical Cyclone Report". National Hurricane Center. Retrieved 2006-12-18. ^ a b Eric S. Blake; Jerry D. Jarrell; Max Mayfield & Edward N. Rappaport (2005). "Costliest U.S. Hurricanes 1900-2004 (unadjusted)". NHC. Retrieved 2006-12-18. ^ David Roth (2005). "Rainfall Summary for Tropical Storm Earl (1992)". Hydrometeorological Prediction Center. Retrieved 2006-12-19. ^ National Hurricane Center (1993). "Tropical Depression One Tropical Cyclone Report Page Three". Retrieved 2006-12-18. ^ David Roth (2005). "Rainfall Summary for Tropical Storm Alberto (1994)". Hydrometeorological Prediction Center. Retrieved 2006-12-19. ^ National Climatic Data Center (1994). "Event Report for Tropical Storm Alberto". Archived from the original on 2011-05-19. Retrieved 2006-12-19. ^ National Climatic Data Center (1994). "Event Report for Tropical Storm Beryl". Archived from the original on 2011-05-19. Retrieved 2006-12-19. ^ National Climatic Data Center (1994). "Event Report for Tropical Depression Ten". Archived from the original on 2011-05-19. Retrieved 2006-12-19. ^ Richard J. Pasch (1995). "Hurricane Gordon Tropical Cyclone Report". National Hurricane Center. Archived from the original on 2008-10-16. Retrieved 2006-12-19. ^ Richard J. Pasch (1995). "Hurricane Allison Tropical Cyclone Report". NHC. Retrieved 2006-12-18. ^ David Roth (2005). "Rainfall Summary for Tropical Storm Dean (1995)". Hydrometeorological Prediction Center. Retrieved 2006-12-19. ^ Edward N. Rappaport (1995). "Hurricane Erin Tropical Cyclone Report". NHC. Archived from the original on 2006-07-01. Retrieved 2006-12-20. ^ Richard J. Pasch (1995). "Tropical Storm Jerry Tropical Cyclone Report". NHC. Archived from the original on 2014-10-28. Retrieved 2006-12-20. ^ Max Mayfield (1995). "Hurricane Opal Tropical Cyclone Report". NHC. Archived from the original on 2015-05-03. Retrieved 2006-12-20. ^ National Climatic Data Center (1995). "Event Report for Hurricane Opal". Archived from the original on 2011-05-19. Retrieved 2006-12-20. ^ a b Miles B. Lawrence (1996). "Hurricane Bertha Tropical Cyclone Report". NHC. Archived from the original on 2010-08-25. Retrieved 2006-12-20. ^ National Climatic Data Center (1996). "Event Report for Hurricane Bertha". Archived from the original on 2011-05-19. Retrieved 2006-12-20. ^ National Climatic Data Center (1996). "Event Report for Hurricane Fran". Archived from the original on 2011-05-19. Retrieved 2006-12-20. ^ Richard Pasch (1997). "Tropical Storm Josephine Tropical Cyclone Report". NHC. Archived from the original on 2013-08-02. Retrieved 2006-12-20. ^ Richard Pasch (1997). "Hurricane Danny Tropical Cyclone Report". NHC. Archived from the original on 2011-05-14. Retrieved 2006-12-20. ^ Max Mayfield (1998). "Hurricane Earl Tropical Cyclone Report". NHC. Archived from the original on 2010-09-02. Retrieved 2006-12-20. ^ a b John L. Guiney (1999). "Hurricane Georges Tropical Cyclone Report". NHC. Archived from the original on 2010-09-01. Retrieved 2006-12-20. ^ NCDC (1998). "Event Report for Hurricane Georges". Archived from the original on 2011-05-19. Retrieved 2006-12-20. ^ John L. Guiney & Miles B. Lawrence (1999). "Hurricane Mitch Tropical Cyclone Report". NHC. Archived from the original on 2014-02-16. Retrieved 2006-12-20. ^ Jack Beven (1999). "Hurricane Dennis Tropical Cyclone Report". NHC. Archived from the original on 2013-10-04. Retrieved 2006-12-20. ^ NCDC (1999). "Event Report for Hurricane Floyd". Archived from the original on 2011-05-19. Retrieved 2006-12-20. ^ John L. Guiney (1999). "Tropical Storm Harvey Tropical Cyclone Report". NHC. Retrieved 2006-12-20. ^ Lixion Avila (1999). "Hurricane Irene Tropical Cyclone Report". NHC. Archived from the original on 2000-08-15. Retrieved 2006-12-20.